2017 repress. 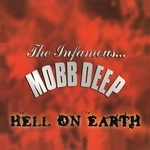 "By the time Mobb Deep hit with their third album -- Hell On Earth -- they were solidified street legends. Coming off the critically acclaimed The Infamous, Havoc and Prodigy hit the lab and came back with a soundtrack that is fitting to its title. Havoc's production is atmospheric; laced with his trademark drums loops and sharp pianos stabs. Add Prodigy's trademark flow and it's evident that the pairing is such an amazing match. While Hell On Earth is essentially a continuation of The Infamous you can still hear the growth in both performers and Hell On Earth stands as some of their best work. 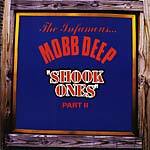 The album features guest appearances by Nas, Raekwon, Method Man, and frequent collaborator Big Noyd."